The kitchen pergola is a perfect blend of an extremely useful and stylish addition to a backyard. It instantly becomes like an entirely additional room for the house. The kitchen pergola picture above has utilized a more dramatic five column angled layout instead of the typical four column square design. A ceiling fan and lighting fixture has been added. Stone walls have been incorporated as bases for the columns and providing space for outdoor kitchen appliances. The pergola roof pieces are spaced to provide ample shade and cut wide to match the more robust columns. This pergola design also includes a double layering of beams and rafters, again to create more bulk to match the base. An additional counter slab added on to create an eat in bar makes this a truly multi-functional pergola. While it would be advisable to have a contractor install the kitchen portion of this design and set out the wiring for the lighting, it is still very possible for a handy home owner to complete the pergola portion. The columns are a very sturdy vinyl composite material. Those, along with the cedar wood roof pieces would be readily available to order at any home improvement center. 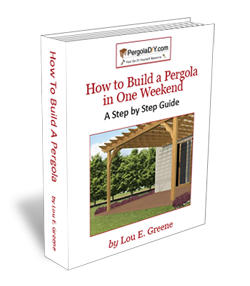 On the other hand, most contractors will probably provide a pretty good price on building the pergola as an add on to the kitchen set. 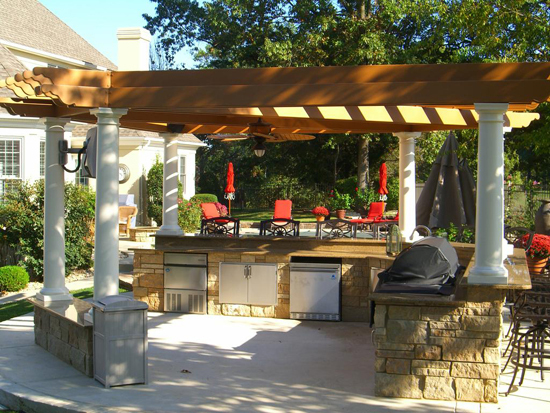 The point is, an outdoor kitchen would not quite be complete without the pergola!